This is a mixed set from Terry 'Buffalo' Ware. Some really nice country rock, a surf rock instro, and some delicate piano and guitar work. Often romantic or bouncing country, Reverb Babylon plays nicely on the road. "Subway Surfin'" has a slightly western melody, with glissandos and surf feel. It's a very coastal song with a driving air about it. Panoramic and a bit gritty. Twang and country flavor, with modulated guitar and a touch goofy melody. Fun and innocence are the watchwords. Long slow panned tremolo slides add depth. This is all about ambiance, with liquid tremolo, a distant feeling, and soft edge. Scenic and relaxed. The Everly Brothers' "Crying In The Rain" is done in a soft, romantic vein, which is furthered by quiet sidewalk cafe accordion. Very pretty! Country rock with slithering slide guitar and rich layered tone. Mandolin adds rustic edge, as does the piano. "Sliding Into The Blue Door" is a very cool instro. Concert hall rock feeling, with a visual melody. "Business As Usual" feels like it's still the nineties and Huey Lewis is up next. A traveling song with very strong writing and playing. Verging on desert western rock, "End Of The Gulch" is a fine instro. Gentle, but powerful, and very easy to listen to. The arrangement is particularly well fleshed out. Furthering the tremolo shimmer of part 1, we are again taken into a desolate water world. gently pleasing. Slow and sensual, "Back Row Rendezvous" is rich in romance via tremolo and a very slow pace. Just a bit sad, with lovely tone and spatial sound. Bouncy and fun, "Tarnation Station" is fun and infectious, with rich tone and a solid beat. Its modern sound is tempered with vintage reverence. Slow, delicate piano notes and soft guitar bring out a reverent bit of sadness. "I Only Pray At Night" is very pretty, easy going, and relaxing. Three guitars and keys paint a traveling image of open road and leaving cares behind. Layered and rich, with a sound that's hard not to enjoy. Very cool writing and arranging. gentle piano and soft guitar paint images of puffy clouds and warm breezes. "Skywriter" is a very gentle track. 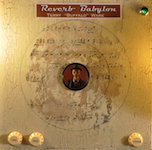 Concluding with part three, "Reverb Babylon" finally unwinds into its mood. Out past the end, there's a vinyl rip of an old song I don't recognize.